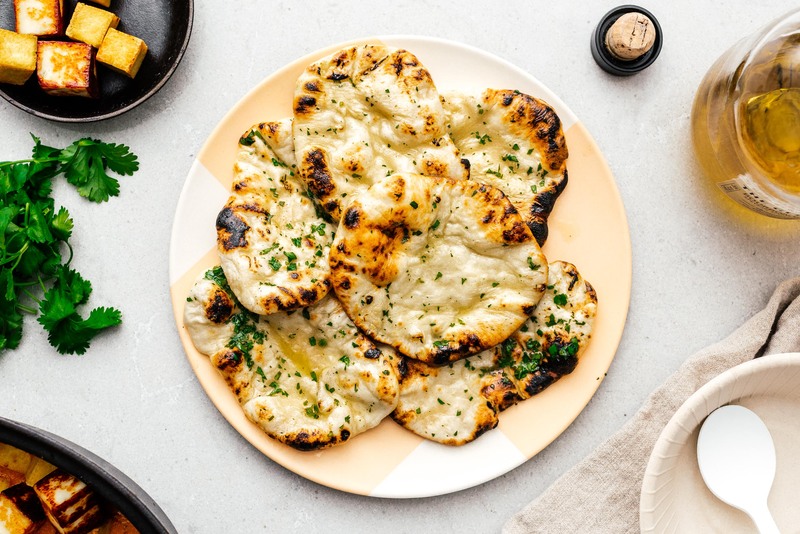 Make homemade naan at home with this basic easy naan bread recipe. 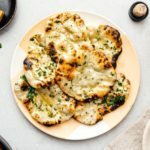 I love naan bread – it’s the perfect accompaniment to Indian curries or stews. And, if I’m being honest, it’s absolutely perfect even on it’s own, especially if you’ve taken the time to make it yourself. This naan bread comes together super quick. The most time consuming part is actually just waiting for the dough to rest. This particular recipe has both milk and yogurt in it. The yogurt gives the bread just the right amount of softness and chew with just a bit of complexity and acid; kind of like a sourdough cheat without the wait. And as a bonus, this recipe doesn’t use yeast for it’s fluffiness, just a simple mix of baking powder and soda. I love the contrast between the fluffy softness and crispy bubbly parts. Happy naan making! Mix the dry ingredients together in a bowl or on a clean work surface. Make a well and slowly add in the milk-yogurt mix bit by bit, combining with the flour. Knead into a soft dough. Gather into ball and cover for 1 hour. Lightly dust your work surface with flour. 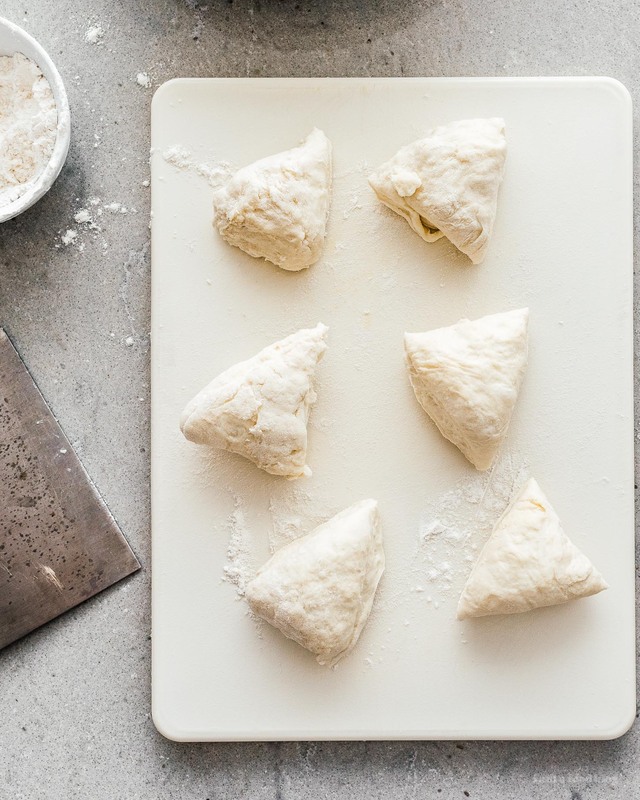 Divide the dough into 4-6 equal pieces and use a rolling pin to flatten and stretch out. Heat up a heavy bottomed or cast iron skillet (with a lid, preferably a glass lid) over high heat. 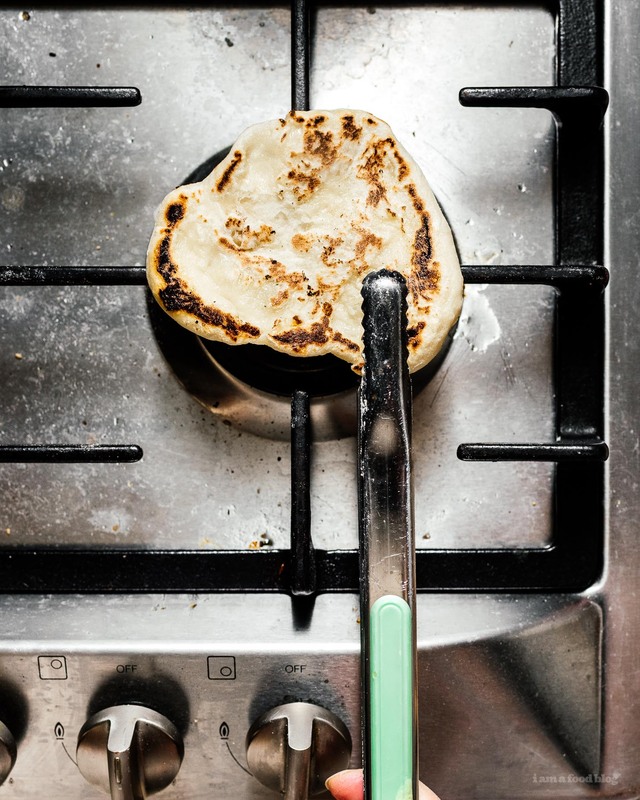 Brush one side of the naan with water and place in the skillet, water side down. Cover the pan and cook for 30 seconds, then check it to see if has started to bubble and rise. Use a pair of tongs and take it off the pan and cook the uncooked side over direct flames until it starts to char. Alternatively, flip and cook the pan until it starts to brown. When the naan is browned on both sides, brush with a bit of melted butter and sprinkle on chopped cilantro. Repeat with the remaining dough. Enjoy warm. Hi do you think this recipe will work with a gluten free flour? i haven’t tried with gluten free flour but i think it might? then again, i’m not too sure how the texture would be. sorry i’m not more help! How do you make this without direct flames?